Chelsea striker Alvaro Morata has missed a handful of good chances in tonight’s Europa League clash in Greece, angering fans across London. The Blues are currently 1-0 up at half-time against PAOK Salonika, in their first game of this season’s Europa League in Group L. Willian fired the visitors into the lead after just 7 minutes and since then they have had plenty more chances to move even further ahead, with Morata guilty of squandering several opportunities. The Spaniard has just one goal to his name so far this term, as he continues his poor form in front of goal in 2018. After initially bursting onto the scene in England during his debut season with the club, the goals quickly dried up for the 25-year-old at the start of the year and he now looks a shadow of the player he once was during spells with Real Madrid and Juventus. 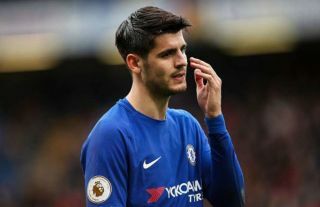 Morata is very much a confidence driven player and clearly struggles to bounce back when things are going against him, which has been evident in the lack of composure he now shows in front of goal, despite regularly being in the right positions to put the ball in the back of the net. Scores of Chelsea fans have taken to Twitter this evening to lambast the misfiring forward, with many visibly frustrated by his inability to finish off the team’s promising attacks in the first 45 minutes of tonight’s game. Lol. Morata is not the CF for Chelsea. I thought they said opportunity comes but once, Morata has seen like 10 opportunities in this game already and missed all ???? If Morata can’t finish with his head anymore, Chelsea gotta sell him to Villarreal or Betis in January. Morata would miss his own funeral. Alvaro Morata lost his confidence at some point last season and has not been able to regain it since. If Morata was wearing number 9 and had blonde hair, you’d think a certain Spaniard by the name of Fernando Torres was still playing for Chelsea. What an awful half for Morata! Please sell Morata absolute gash ?